The notes below apply if you run a small web design studio that needs to assure a good level of service to your clients with the most efficiency. This means cutting down repetitvie tasks, like setting up a Google Analytics Account for every website a client needs. To begin, we need some configuration on Google Analytics, later we will tie it all down with Nginx. Pretty self explanatory really. Just set up an account, let’s call it StudioX and create a property called Client 1. The property’s settings can be whatever you wish, just make sure that the default URL is real. Let’s imagine Client 1 owns 2 websites that you have created, we will need to setup a data view for each of them. At the view level you can set a new Default URL, and you can also set a switch for Bot filtering that removes the known bots to from your reports. This is straightforward, add a new filter to you view so that it only shows the hostname of the website we want to track. It’s quite simple, in every website hosted by Nginx, it will replace the </head> tag for the google analytics code we had previously. After that’s done, we just include the analytics.conf file in the server block of our website. What is below is an example, don’t just copy and paste it to your config. 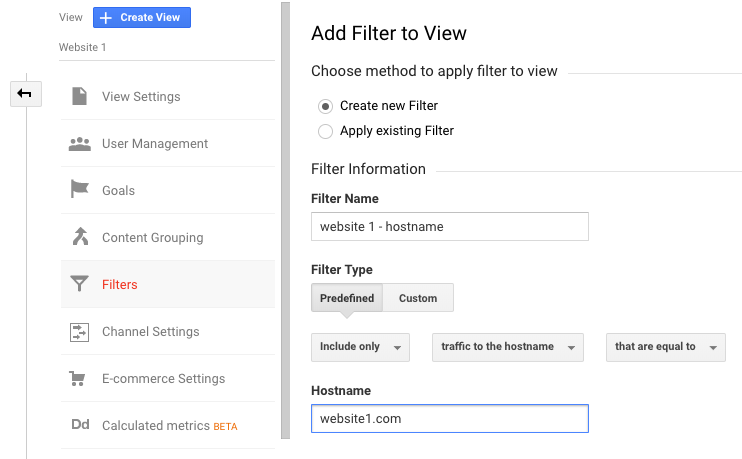 From now on, each time you need to track analytics for a new website that belongs to Client1, just add a new view, change the Default URL and setup the filter to only track traffic to that hostname. It’s two steps in Google Analytics, instead of three in your Content Management System (CMS) and Analytics Account. I haven’t tested, but in theory you can setup your View after the site goes live. Your data should already be there because the Google Analytics Property was already collecting information, it just wasn’t filtering by hostname. You can also create different analytics.conf files, one for each Client/Property you want to use. Something like analytics.client1.conf, analytics.client2.conf. There is one small caveat, with this implementation you can only track 25 websites for that Property. You can take it one step further by using the Google Tag Manager code. It’s the same procedure and you gain the hability to setup new events across all sites. Within Google Tag Manager you can also fire the analytics code, but that would be a matter for another article. Feel free to leave a comment if you find something you would like to add.